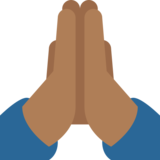 This is how the 🙏🏾 Folded Hands: Medium-Dark Skin Tone emoji appears on Twitter Twemoji 2.2.1. It may appear differently on other platforms. Twemoji 2.2.1 was released on Oct. 3, 2016.